We're honored to be recognized in Outside Magazine's Best Places To Work for 2015. Each year, OUTSIDE recognizes the top 100 companies in the United States helping their employees strike the ideal balance between work and play. Seattle, WA (November 16, 2015) – The Mountaineers, an outdoor nonprofit based in the Pacific Northwest, has been selected as one of OUTSIDE’s Best Places to Work 2015. For over 100 years, The Mountaineers has been getting people outside safely and responsibly. With staff and volunteers delivering memorable outdoor programs and a nationally recognized publishing division, The Mountaineers is actively creating future generation of stewards for the outdoors. Each year, OUTSIDE recognizes the top 100 companies in the United States helping their employees strike the ideal balance between work and play. These companies encourage employees to lead an active lifestyle, are eco-conscious, and prioritize giving back to the community. The entire list of winners appears online at http://www.outsideonline.com/2034286/100-best-places-work-2015. If you were to ask a Mountaineers employee why it’s cool to work for The Mountaineers, you’re likely to get a wide range of answers. “I get to work with people like Dr. Tom Hornbein and Jim Whittaker – the first Americans to reach the summit of Everest – and National Geographic caliber photographers like Florian Schulz. That’s not something you get with a normal 9-to-5 job. It’s unique to working for an organization with a tremendous legacy,” says Lace Thornberg, who has been with the organization for the past two years. Mountaineers staff enjoy a range of job benefits. Perks include tangible benefits like copies of every new publication, two free courses per year, and discounts on outdoor gear, as well as work-life balance benefits including bring-your-dog-to-work days, climbable basalt columns and five separate climbing walls between the Tacoma and Seattle Program Centers, and access to Mountaineers lodges at Mt. Baker, Stevens Pass, and Stampede Pass. Ultimately though, it’s an intangible benefit that makes Mountaineers staff love coming to work: the clubs’ members and donors are so inspiring. Each week The Mountaineers highlight a member in their blog, featuring stories from members new and seasoned. “I was doing a lot of hiking alone, and I decided to give the Mountaineers a try,” said hike leader and 5-year member Arin Sharkey. “I was immediately blown away by how friendly everyone was, and when it was suggested that I become a hike leader I jumped on the chance to give back to the community.” This is just one of 10,000 similar stories. Taught outdoor skills to 3,400 people through 215 courses and over 1800 activities. Traveled 80,199 miles hiking, scrambling, climbing, and kayaking. Gained 24,165,000 feet of elevation climbing, scrambling, hiking, and snowshoeing. Published 24 new outdoor recreation and conservation advocacy books. Provided 6,500 youth experiences, about half of which were provided on a scholarship basis to kids who wouldn’t otherwise have access to the outdoors. Worked on important conservation issues affecting Pacific Northwest recreationists like providing support for the Mountains to Sound Greenway and Land and Water Conservation Fund. “None of this work would be possible without out the support of 1,800 volunteers, 10,800 members, and hundreds of generous donors who value the outdoors and care about protecting it,” adds Lunney. “The companies recognized in this year’s Best Places to Work list are the gold standard for stellar work environments that seek to empower their employees both in and out of the office,” said OUTSIDE Online Editor Scott Rosenfield. To find the best places to work in the United States in 2015, OUTSIDE created five company categories: Adventure/Travel, Wellness, Culture, Gear, and Media. OUTSIDE then conducted a rigorous vetting process in partnership with the Best Companies Group to assess the policies, practices, and demographics of hundreds of companies. Outside’s Best Places to Work 2015 was driven by employee reviews of their workplaces, taking into account factors like corporate culture, role satisfaction, work environment and overall employee engagement. The Best Places to Work list represents the cream of the crop: companies that are empowering their employees to live bigger, better lives. The complete list of Best Places to Work winners is featured online at http://www.outsideonline.com/2034286/100-best-places-work-2015..
About The Mountaineers: The Mountaineers is the leading outdoor recreation organization of the Pacific Northwest, dedicated to educating and inspiring people of all ages to explore the outdoors and conserve our public lands and waterways. We offer courses and outdoor activities led by trained and experienced volunteer instructors who are dedicated to promoting safe and responsible enjoyment of the outdoors, and have a nationally recognized publishing division encouraging exploration worldwide. The Mountaineers advocates for access and protection of recreational lands and waterways and promotes minimal impact recreation practices. Learn more at www.mountaineers.org and www.mountaineersbooks.org. Header Image: Publishing division staff in the Mountaineers Books warehouse (top), photo by: Helen Cherullo. Program center staff outside the Seattle clubhouse (bottom), photo courtesy of The Mountaineers. 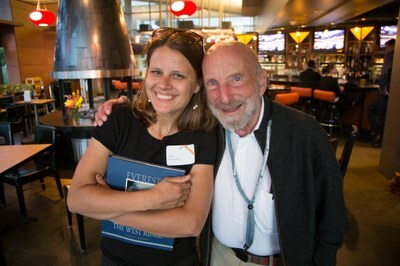 Everest pioneer and author Dr. Tom Hornbein with Mountaineers Books staff member Lace Thornberg, photo by : Stephen Spickard. Mountaineers member Carrie Grage, courtesy of Carrie Grage. 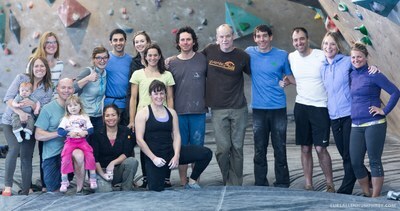 Alex Honnold climbing with a group of Mountaineers supporters and staff at the Seattle Bouldering Project, photo by Luke Humphrey. Not only is The Mountaineers the best place to work in America, it's the best place to learn and VOLUNTEER in the world! Congrats everyone - staff and member alike. This is great recognition of something we already knew: that our 100+ year old organization is something really special.